Here we explore the different macrobiotic sea vegetables. The macrobiotic diet is based on those foods eaten by the world’s healthiest societies and includes sea vegetables, as eaten by the people of Okinawa and many parts of Asia. In macrobiotic cooking sea vegetables can be used in soups, stews and salads. They are used to make macrobiotic maki or sushi. Sea vegetables are highly nutritious and make a helpful addition to a macrobiotic vegan diet. They can easily be added to many common macrobiotic recipes. 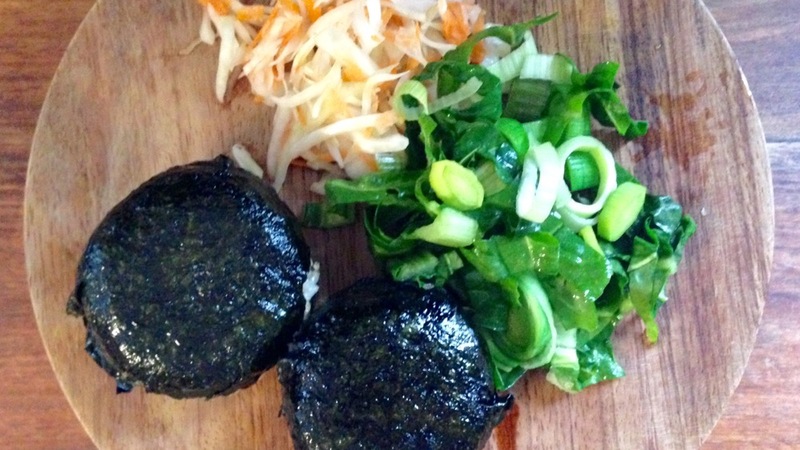 Macrobiotic sea vegetables are those sea vegetables that are grown, harvested and dried naturally. Ideally they would come from clean waters. Choose the nearest source of macrobiotic sea vegetables to you. These are sea vegetables typically used in a macrobiotic diet and are a nutritious addition to your macrobiotic cooking practice. Agar agar is sold as fine flakes or in bars. Agar agar is a translucent white. Agar agar has a very subtle taste and often not noticeable in dishes. It is used to make a aspic or jelly called kanten. 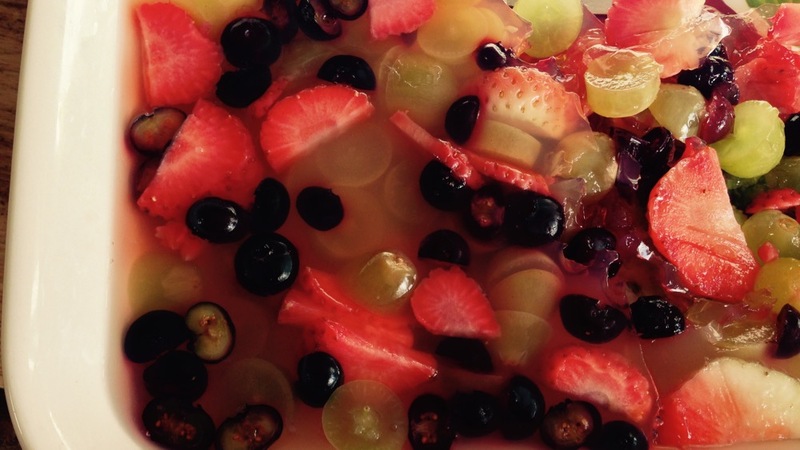 It can be used to make fruit deserts or to make a vegetable and or bean aspic. Suggested serving. 1 tbs for one cup of water. Arame is consists of long dry, fine, black, shafts of sea vegetable. Arame has a mild salty taste with a subtle taste of the sea. Arame has a delicate texture. Arame does not need to be cooked and can be added to salads raw. It makes a colourful contrast to other vegetables. Suggested serving is about 1/8 cup (small handful) per person. Dulse is a dry, purple sea vegetable. It is sold in short strips, often with several layers folded into each other. Dulse is commonly eaten wet. Dulse has a stronger salty taste and a more distinct taste of the sea. When wet is has a smooth, slippery texture. You can add dulse to soups at the end of cooking, or moisten with water, and add to salads or any vegetable dish, including steamed vegetables, pressed salads or blanched vegetables. Suggested serving is about 1 inch or 2cm strip daily. 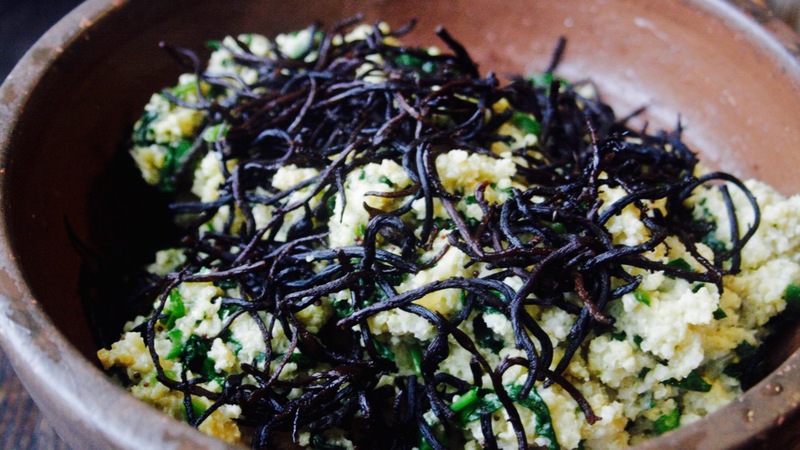 Hiziki is black in colour and consists of long dry strings of sea vegetable. Hiziki has a strong salty taste with a hint of the sea. It has a more chewy texture. 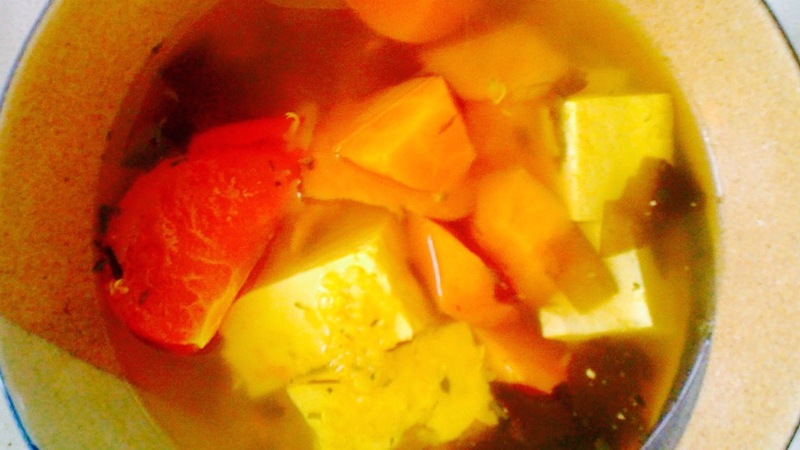 Hiziki can be added to stews. It is typically cooked with carrots where the contrast in colours make an attractive dish. Hiziki can also be cooked with brown rice and carrots to make a satisfying, nutritious dish. Kombu is sold dry in strips or broad sheets. It is a more leathery, thicker sea vegetable, that is dark green in colour. Kombu has a mild taste and often not noticeable when added to stews. Kombu is use to make broths, Japanese term dashi, where the kombu is simmered with dried shiitake mushrooms and bonito flakes for about 20 minutes. The kombu help create a savoury umami taste. This relates to metal in the five elements. Kombu can be used in stews, soups and bean dishes. It is claimed to aid the digestion of beans. Kombu can be used to add minerals and flavour liquids, or cut fine and eaten with the dish. Suggested serving is about 1 inch or 3cm strip daily. Is sold in flat thin sheets, similar to paper. You can buy nori toasted, or untoasted. If you buy untoasted nori you can toast it over a gas flame or electric ring. Nori is dark green. Nori has a peasant dry, toasted taste. Once it is wet it develops a stronger smell and taste of the sea. When dry it has a crisp texture. When wet it becomes slimy. It can be eaten as a snack. Just tear into strip and eat. 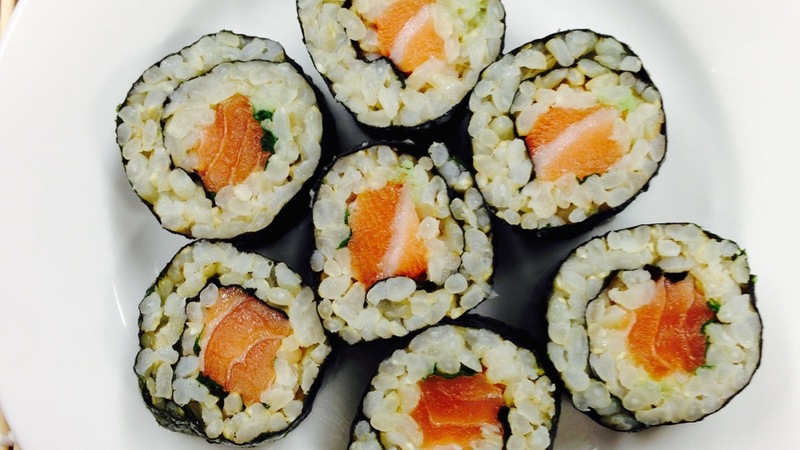 You can make maki and sushi rolls using nori. You can add it to salads, soups, nabe, noodles, natto and brown rice. Cut into fine strips and add for taste and decoration. Suggested serving is a half to one sheet daily. 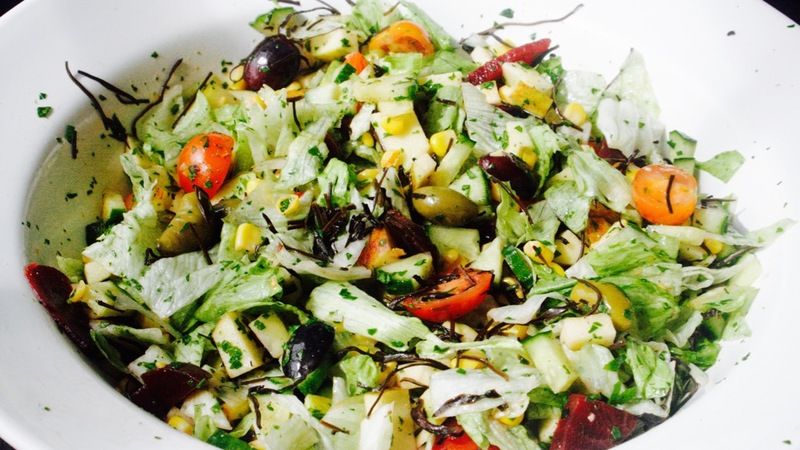 Mixed sea vegetable salads are sold dry, and consist of a variety of sea vegetables pre-cut and mixed together. They are usually eaten moist. Some mixtures will have an appealing mix of colours and textures. When damp they have a salty taste and slippery texture. Some mixtures will have a stronger taste of smell of the sea. You can soak in a small amount of water, so the water soaks into the sea vegetables, rather than the nutrients dissolve into the water. The wet sea vegetables can be added to raw salads, steamed vegetables, pressed salads or blanched vegetables. You can also add the sea vegetable salad mix to soups dry, at the end of cooking. Suggested serving is about 1 tsp daily. Tororo Kombu is pickled kombu / kelp that has been finely shredded. It feels soft with a light pale green colour. Tororo kombu has a sweet taste and disolves in the mouth. Tororo kombu is typically added to noodles in broth, nabe and soups. You can add tororo kombu at the end of cooking. Suggested serving about one tbs per person. Wakame is sold dry in long crinkly strips. It is usually eaten wet. It has a vibrant green colour wet. Wakame has a salty taste and smooth slippery texture. The smell can be reminiscent of the sea. Wakame is typically eaten in soups and salads. It adds a clean, mild, salty taste. If cut fine it is not obvious in soups. Typically cut into small pieces dry and add to soups at the end of cooking. Suggested serving is a 1 inch or 3cm strip daily. Samphire is a fresh sea vegetable that is green in colour. Samphire has a salty taste and a crunchy texture. It can be eaten raw in salads, lightly steamed or quickly blanched. If it is too salty you can rinse and wash of the salt. Suggested serving. Half cup per person. Sea vegetables are nutrient rich, alkaline forming and research suggests have the ability to help us eliminate substances that may be toxic to us. NUTRIENTS – Sea vegetables contain a wide variety of nutrients from the sea and are especially rich in iron, calcium and iodine. If used regularly sea vegetables can be a useful source of these nutrients. Generally, it is recommended to eat small quantities of sea vegetables daily, and for this reason they are not typically the prime source for nutrients. ANTI-OXIDANTS – Sea vegetable are a good source of potentially healing anti-oxidants. They contain a range of anti-oxidant alkaloids. ALKALINE FORMING – Sea vegetables are alkaline forming and help us maintain a more alkaline condition. Research suggests this may help prevent cancer and arthritis. In addition maintaining a more alkaline condition is thought to improve our immune system. CLEANSING – Research after WW2 suggested that sea vegetable wakame may help the body cleanse radioactive particles and sea vegetables in general are thought to be have a cleansing influence on our bodies. ANTI-INFLAMMATORY – The anti-inflammatory properties of sea vegetables make them helpful for joins, digestion and pains caused by inflammation. ANTI-CANCER PROPERTIES – Initial research suggests that eating sea vegetables may reduce the risk of colon cancer. In addition sea vegetables may have an influence on estrogens, and therefore estrogen related breast cancer. LOWER CHOLESTEROL – Sea vegetables have been demonstrated to lower total and LDL cholesterol with associated benefits to the heart and circulation. Sea vegetables have a chi that is associated with the five element water and can generally be said to have a more yin, cooling quality. From this perspective sea vegetables help us feel calmer, peaceful and spiritual. They would aid flexibility, cleansing and sexual vitality. Because of the high levels of iodine, sea vegetables could be a risk for someone with an over active thyroid. Sea vegetables would, in theory, be helpful for a underactive thyroid, however, if they are used in conjunction with medication, regular medical tests would be advisable. Store dried sea vegetables in a dry, dark cupboard. Most dried sea vegetables are packaged in re-sealable bags. These help keep the sea vegetables fresh. Archaeologists claim sea vegetables have been eating in Asia for about 10,000 years. They have a long history of being part of a traditional Japanese diet. Most coastal societies would have found sea vegetables easy to collect, nutritious and a stable food supply. In tidal areas, sea vegetables can be readily harvested when the tide goes out. Sea vegetables would have provided a concentrated source of a wide range of nutrients. Sea vegetables would be available all year. Sea vegetables were easy to dry in the sun and if kept dry last many years. If you like evolution theory, and think we evolved from sea creatures, then sea vegetables would be our oldest and most original food. In a sense the sea is our evolutionary mother and eating her foods awakens a very distant biological memory of coming home. For help with a macrobiotic diet, and learn to improve your health naturally book a macrobiotic consultation with Simon. Macrobiotic consultations can be in person or on-line and include menu plans, suggestions, recipes and on-going support. Call 07543663227 or email for more information.